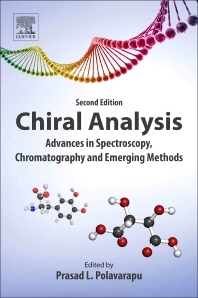 Chiral Analysis: Advances in Spectroscopy, Chromatography and Emerging Methods, Second Edition covers an important area of analytical chemistry of relevance to a wide variety of scientific professionals, including chemistry graduate students, analytical chemists, organic chemists, professionals in the pharmaceutical industry, and others with an interest in chirality and chiral analysis. This thoroughly revised second edition covers several new, important areas of chiral analysis that have emerged since the first edition. Three of the new methods provide higher sensitivity than can be realized with the current methods and are expected to become mainstream applications: cavity based methods offer vastly higher sensitivity than conventional polarimetric methods, microwave chiral detection provides unsurpassed sensitivity for identifying diastereomers, and the rotating electric field method offers a competing new approach for the separation of enantiomers. Another topic, chirality in extraterrestrial life, has not been discussed in any other book and is important for understanding the origin of life.